Sunday October 7th 1883 I worked hard all day long and was so tired when night came I was nearly sick Hatt was over with both the children they were real good. 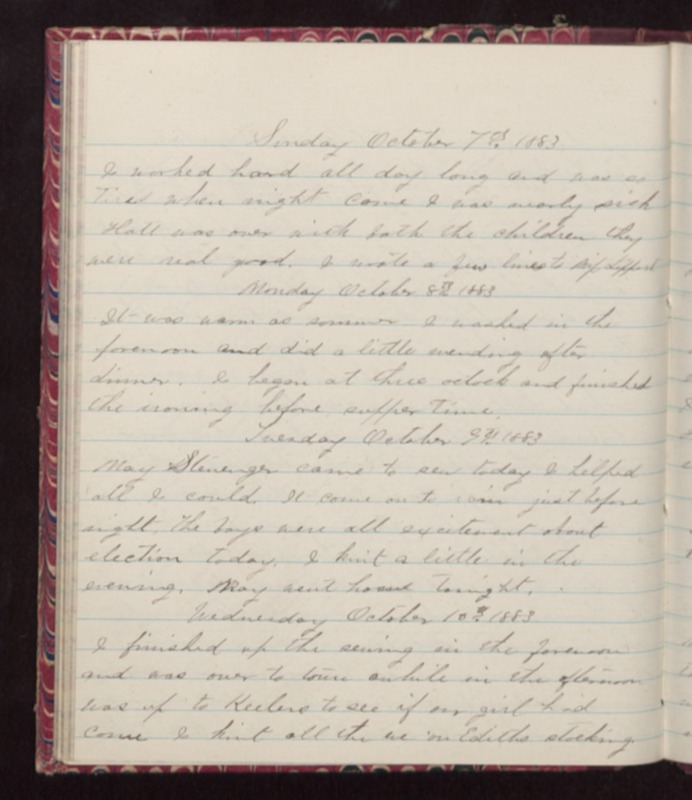 I wrote a few lines to Miss Lippert Monday October 8th 1883 It was warm as summer I washed in the forenoon and did a little mending after dinner. I began at three oclock and finished the ironing before supper time. Tuesday October 9th 1883 May Stenenger came to sew today I helped all I could. It come on to rain just before night. The boys were all excitement about election today. I knit a little in the evening. May went home tonight. Wednesday October 10th 1883 I finished up the sewing in the forenoon and was over to town awhile in the afternoon Was up to Keelers to see if our girl had come I knit all the eve on Ediths stocking.